Sunday next, 11 February 2018, is the Sunday before Lent. The readings in the Revised Common Lectionary (RCL) for that Sunday are: II Kings 2: 1-12; Psalm 50: 1-6; II Corinthians 4: 3-6; and Mark 9: 2-9. Normally, there is an alternative set of readings for this Sunday in Year B (I Samuel 3: 1-10 [11-20]; Psalm 139: 1-5, 12-18; II Corinthians 4: 5-12; and Mark 2: 23 to 3: 6). However, this alternative is not provided in 2018, as it is required this year for the first Sunday after Trinity, 3 June 2018. 2 Καὶ μετὰ ἡμέρας ἓξ παραλαμβάνει ὁ Ἰησοῦς τὸν Πέτρον καὶ τὸν Ἰάκωβον καὶ τὸν Ἰωάννην, καὶ ἀναφέρει αὐτοὺς εἰς ὄρος ὑψηλὸν κατ' ἰδίαν μόνους. καὶ μετεμορφώθη ἔμπροσθεν αὐτῶν, 3 καὶ τὰ ἱμάτια αὐτοῦ ἐγένετο στίλβοντα λευκὰ λίαν οἷα γναφεὺς ἐπὶ τῆς γῆς οὐ δύναται οὕτως λευκᾶναι. 4 καὶ ὤφθη αὐτοῖς Ἠλίας σὺν Μωϋσεῖ, καὶ ἦσαν συλλαλοῦντες τῷ Ἰησοῦ. 5 καὶ ἀποκριθεὶς ὁ Πέτρος λέγει τῷ Ἰησοῦ, Ῥαββί, καλόν ἐστιν ἡμᾶς ὧδε εἶναι, καὶ ποιήσωμεν τρεῖς σκηνάς, σοὶ μίαν καὶ Μωϋσεῖ μίαν καὶ Ἠλίᾳ μίαν. 6 οὐ γὰρ ᾔδει τί ἀποκριθῇ, ἔκφοβοι γὰρ ἐγένοντο. 7 καὶ ἐγένετο νεφέλη ἐπισκιάζουσα αὐτοῖς, καὶ ἐγένετο φωνὴ ἐκ τῆς νεφέλης, Οὗτός ἐστιν ὁ υἱός μου ὁ ἀγαπητός, ἀκούετε αὐτοῦ. 8 καὶ ἐξάπινα περιβλεψάμενοι οὐκέτι οὐδένα εἶδον ἀλλὰ τὸν Ἰησοῦν μόνον μεθ' ἑαυτῶν. 2 Six days later, Jesus took with him Peter and James and John, and led them up a high mountain apart, by themselves. And he was transfigured before them, 3 and his clothes became dazzling white, such as no one on earth could bleach them. 4 And there appeared to them Elijah with Moses, who were talking with Jesus. 5 Then Peter said to Jesus, ‘Rabbi, it is good for us to be here; let us make three dwellings, one for you, one for Moses, and one for Elijah.’ 6 He did not know what to say, for they were terrified. 7 Then a cloud overshadowed them, and from the cloud there came a voice, ‘This is my Son, the Beloved; listen to him!’ 8 Suddenly when they looked around, they saw no one with them any more, but only Jesus. How does this Gospel reading relate to the other lectionary readings for that Sunday? In the New Testament reading (II Corinthians 4: 5-12), the Apostle Paul talks about the minds of unbelievers being blinded, while our eyes should be focussed on the light of the Gospel, which is the glory of Christ, who is the image of God (verse 4), and of light shining out of darkness (verse 6). So, there are visible threads that link the three readings and the Psalm, and these are going to be obvious to the attentive listener in Church on Sunday week. The Synoptic accounts of the Transfiguration are very similar in wording. So, what is different between Saint Mark’s account of the Transfiguration and the accounts in the other two Synoptic Gospels? All three accounts tell us that Christ’s robes become dazzling white, but Saint Mark alone tells us they are a white ‘such as no one on earth could bleach them’ (verse 3). Should we describe the Transfiguration as a miracle? If we do, then it is the only Gospel miracle that happens to Christ himself. On the other hand, Saint Thomas Aquinas spoke of the Transfiguration as ‘the greatest miracle,’ because it complemented Baptism and showed the perfection of life in Heaven. None of the Gospel accounts identifies the ‘high mountain’ by name. The earliest identification of the mountain as Mount Tabor was by Jerome in the late fourth century. But does it matter where the location is? As for the cloud, all three Synoptic Gospels describe the cloud’s descent in terms of overshadowing (επισκιαζειν, episkiazein), which in Greek is a pun on the word tent (σκηνάς, skenas). But this is also the same word used to describe the Holy Spirit overshadowing the Virgin Mary at the Annunciation: καὶ δύναμις ὑψίστου ἐπισκιάσει σοι (Luke 1: 35). ● They represent the Law and the Prophets – Moses receives the Law from God, and Elijah is a great prophet. ● They both experience visions of God – Moses on Mount Sinai and Elijah on Mount Carmel. ● They represent the living and the dead – Elijah, the living, because he is taken up into heaven in a chariot of fire (see our Old Testament reading for this day), and Moses, the dead, because he does experience death. Moses and Elijah show that the Law and the Prophets point to the coming of Christ, and their recognition of and conversation with Christ symbolise how he fulfils ‘the law and the prophets’ (Matthew 5: 17-19). Moses and Elijah also stand for the living and dead, for Moses dies and his burial place is known, while Elijah is taken alive into heaven in order to appear again to announce the time of God’s salvation. It was commonly believed that Elijah would reappear before the coming of the Messiah (see Malachi 4), and the three interpret Christ’s response as a reference to Saint John the Baptist (Matthew 17: 13). 3, The Disciples: Saint Peter, Saint James and Saint John are with Christ on the mountain top. But, we may ask, why these three disciples? Do you remember how this might relate to Moses and Elijah? Moses ascends the mountain with three trusted companions, Aaron, Nadab and Abihu, to confirm the covenant (Exodus 24: 1), and God’s glory covers the mountain in a cloud for six days (Exodus 25 to 31). In some ways, Saint Peter, Saint James and Saint John serve as an inner circle or a ‘kitchen cabinet’ in the Gospels. Perhaps this intimacy is reflected in the fact that they are the only disciples who are given nickname by Christ: Simon becomes the Rock, and James and John are the sons of thunder (Luke 5: 10). They are at the Transfiguration (Matthew 17: 1, Mark 9: 2; Luke 9: 28), but they are also at the raising of the daughter of Jairus (Mark 5: 35-43; Luke 6: 51), they are at the top of the Mount of Olives when Christ is about to enter Jerusalem (Mark 13: 3), they help to prepare for the Passover (Luke 22: 8), and they are in Gethsemane (Matthew 26: 37). Jerome speaks of Saint Peter as the rock on which the Church is built, Saint James as the first of the apostles to die a martyr’s death, Saint John as the beloved disciple. The Transfiguration reveals Christ’s identity as the Son of God. In the Gospel, after the voice speaks, Elijah and Moses have disappeared, and Christ and the three head down the mountain. The three ask themselves what he means by ‘risen from the dead’ (Mark 9: 9-10). When they ask Christ about Elijah, he responds: ‘Elijah is indeed coming and will restore all things; but I tell you that Elijah has already come …’ (Mark 9: 12-13). He tells them to keep these things a secret until the Son of Man has risen from the dead. Yet, in keeping with the Messianic secret, he tells the three not to tell others what they have seen until he has risen on the third day after his death. Saint Peter’s reference to the booths could imply that the Transfiguration took place during the time of the Feast of Tabernacles, when Biblical Jews were camping out in the fields for the grape harvest. This Feast also recalled the wanderings in the wilderness recorded in the Book Exodus. At first, the feast of the Transfiguration belonged to the pre-Easter season of the Church and was celebrated on one of the Sundays of Lent. A sermon on the Transfiguration was preached in Lent by Saint John Chrysostom while he was a priest in Antioch in 390. 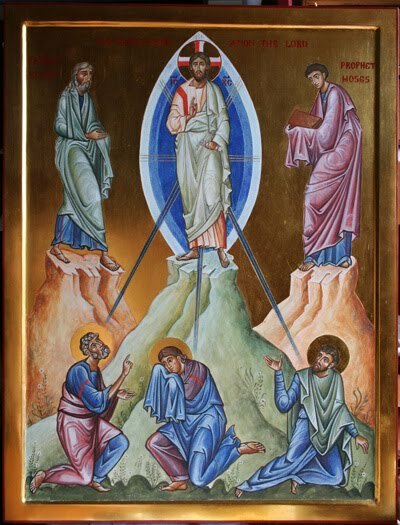 The Feast of the Transfiguration was celebrated on Mount Sinai from the mid-fifth century, and in Constantinople from the late seventh century. Saint Gregory Palamas, the great teacher of the Transfiguration, is commemorated during Lent. From 1474 until at least 1969, it was observed in the Roman Catholic Church on the Second Sunday in Lent. In some modern calendars, including Roman Catholic, Lutheran and Anglican calendars, the Transfiguration is now commemorated on the Sunday immediately before Ash Wednesday, although traditionally, the Feast of the Transfiguration is observed in the Anglican, Roman Catholic and Orthodox calendars on 6 August. It may have been moved there because 6 August is 40 days before 14 September, the Feast of the Holy Cross, so keeping the tradition that the Transfiguration took place 40 days before the Crucifixion. Among Anglicans, the Feast of the Transfiguration disappeared from the 1549 Book of Common Prayer. When it reappeared in the 1662 Book of Common Prayer, it returned to the calendar but without any other provisions. In The Book of Common Prayer (2004), the Church of Ireland has Collects and Post-Communion prayers for the Feast of the Transfiguration on 6 August, along with this alternative provision to mark the Transfiguration on the Sunday before Lent. ● The Procession of the Cross (1 August). 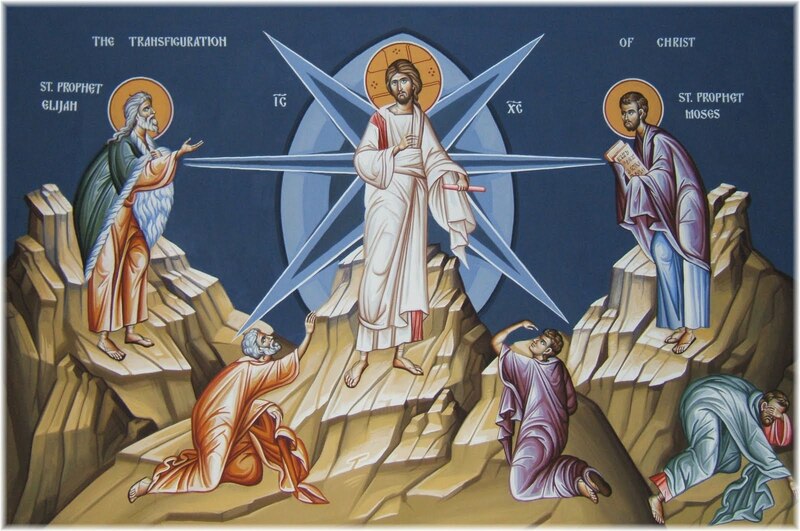 ● The Transfiguration (6 August). But the Transfiguration also has associations with ordinations: from the time of Pope Leo the Great (died 460), the Transfiguration was the Gospel reading set for Ember Saturday, the day before ordinations. The Transfiguration is both an event and a process. The original Greek word for Transfiguration in the Gospel accounts is μεταμόρφωσις (metamorphosis), which gives us access to a deeper and more theological meaning, a deeper truth, than the word derived from the Latin transfiguratio, which can be translated by ‘to be changed into another from.’ But the Greek μεταμόρφωσις means ‘to progress from one state of being to another.’ Consider the metamorphosis of the chrysalis into the butterfly. Saint Paul also uses the word μεταμόρφωσις when he describes how the Christian is to be transfigured, transformed, into the image of Christ (II Corinthians 3: 18). The metamorphosis invites us into the event of becoming what we have been created to be. This is what Orthodox writers call deification. Transfiguration is a profound change, by God, in Christ, through the Spirit. And so, the Transfiguration reveals to us our ultimate destiny as Christians, the ultimate destiny of all people and all creation to be transformed and glorified by the majestic splendour of God himself. The Transfiguration points to Christ’s great and glorious Second Coming and the fulfilment of the Kingdom of God, when all of creation will be transfigured and filled with light. The vision of Christ in his glory and the experience of the divine light are at the very heart of both Orthodox mysticism and Orthodox eschatology. The ‘uncreated light’ is a hallmark theme in Orthodox spirituality, especially in the writings of Saint Gregory Palamas and the school of the thought that is hesychasm, which draws constantly on the themes of the Transfiguration. In a lecture in Cambridge some years ago , Metropolitan Kallistos [Ware], the pre-eminent Orthodox theologian in England, spoke of the Transfiguration as a disclosure not only of what God is but of what we are. The New Adam shows us human nature as it was before the fall. The Transfiguration looks back to the beginning, but also looks forward to the end, to the final glory of Christ’s second coming, because through the incarnation Christ raised human nature to a new level, opening new possibilities. The incarnation is a new beginning for the human race, and in the Transfiguration we see not only our human nature at the beginning, but as it can be in and through Christ at the end, he told the Summer School organised in Sidney Sussex College that year by the Institute for Orthodox Christian Studies. Secular Christianity rests satisfied with our human nature as it is now. But he wants us to look to our potentialities, as seen in the Transfiguration of Christ. The light of the Transfiguration embraces all created things, nothing is irredeemably secular, all created things can be bathed in the light of the Transfiguration. But with the Transfiguration comes the invitation to bear the cross with Christ. Peter, James and John were with Christ on Mount Tabor and with him in Gethsemane. We must understand the Passion of Christ and the Transfiguration in the light of each other, not as two separate mysteries, but aspects of the one single mystery. Mount Tabor and Mount Calvary go together; and glory and suffering go together. If we are to undertake the task of Transfiguration, we cannot leave our cross behind. If we are to bring the secular, fallen world into the glory of Christ, that has to be through self-emptying κένωσις (kenosis), cross-bearing and suffering. There is no answer to secularism that does not take account of the Cross, as well taking account of the Transfiguration and the Resurrection. The light which shone from Christ on the mountaintop is not a physical and created light, but an eternal and uncreated light, a divine light, the light of the Godhead, the light of the Holy Trinity. The experience on Mount Tabor confirms Saint Peter’s confession of faith which reveals Christ as the Son of the Living God. Yet Christ remains fully human as ever he was, as fully human as you or I, and his humanity is not abolished. But the Godhead shines through his body and from it. In Christ dwells all the fullness of the Godhead. But at other points in his life, the glory is hidden beneath the veil of his flesh. What we see in Christ on Mount Tabor is human nature, our human nature, taken up into God and filled with the light of God. ‘So this should be our attitude to the secular world,’ Metropolitan Kallistos said. Is this a more appropriate time for celebrating the Transfiguration? Can you identify with Saint Peter’s hasty response? Or do you sometimes feel terrified in the presence of God, and know not what to do? Saint Matthew alone has Christ telling the three disciples: ‘Get up and do not be afraid.’ (Matthew 17: 7). What are people’s fears today? What role have we in calming those fears and in reassuring people of the presence of Christ? Where do you think people can be brought to see Christ today? In the Church? In the poor? In themselves? Look at verse 9. Is there an appropriate time for mission and an inappropriate time? Note the liturgical colour returns to Green for Monday and Tuesday, and then turns to Violent on Wednesday 14 February (Ash Wednesday). Updated with additional liturgical resources, 10 February 2018.